This guest post by Shane Hogan is one of a series of blog items written by sports management students in the Limerick Institute of Technology. Photo of Semple Stadium by Galwaybay FM. My personal best is winning a schools hurling final in Semple Stadium with with Ballinaclough National School. I was twelve years of age. It was a dream to play in Semple Stadium. 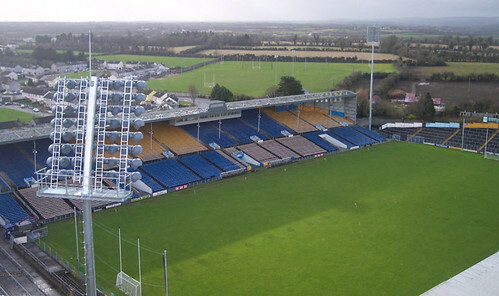 The stadium is situated in Thurles Co. Tipperary and this is where the Gaelic Athletics Association was founded in 1884. Thurles has always been renowned as the home of hurling so to get the chance to play on the same field as many of my heroes have done in the past is something I will never forget. We are from a small village with a low population. We live and breed hurling in our locality. Our school is pretty small--between thirty and forty students. When we moved into sixth class there were nine boys in my class and we formed the backbone of the team. It was very unusual in our school to have such a large class of all boys so I guess we were destined in a way for glory. We trained all year with our coach who was also our principal. We had lots of bumps along the road but we stuck together as a team and ended up victorious. Running out onto the field of Semple Stadium on that day is something I will never forget. Looking up into the stands and spotting my family was pretty emotional. I knew this was more than likely the only occasion I would get to play on this field. This was not the first time that our school had reached the county final but I was too young to participate. I remember the agony of the loss and it was felt by everyone in our school. We said if we ever got to the final again that we would not be coming home empty handed the next time and we did not disappoint. I was playing in the backs and I remember having a good game. To be able to win such a prestigious trophy with lads from my locality was surreal. Most of the people on the team are still some of my best friends today. Days like that stick in the memory for a long time and we often reminisce when we get together. We got presented with the trophy on the field and friends and our families joined in on the celebrations. When we arrived home we drove through the village with trophy beeping horns and singing songs. We were presented with our medals a few days later and it is still at home locked away safe so I will not lose it. I will never forget that day in Thurles.